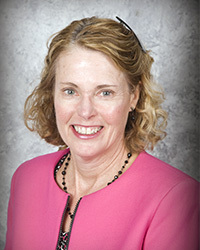 Dr. Beth Sullivan became an assistant faculty for the Department of Occupational Therapy at the university in 2018. Prior to joining the university, she worked as the program director, faculty member, and developer of an occupational therapy assistant program in Bedford Park, Illinois. Dr. Sullivan has worked as a therapist and manager in settings from acute care to skilled nursing. As an occupational therapist in an outpatient setting, she developed and provided interventions for individuals with low-vision conditions and an older adult driving rehabilitation program. She is a member of the American Occupational Therapy Association (AOTA), as well as the California Occupational Therapy Association (OTAC). Dr. Sullivan’s volunteer experiences include aiding older adults with daily activities, engaging in short-term mission trips to Haiti, and assisting in providing lectures for its first occupational/physical therapy university (Université Épiscopale d’Haïti). Dr. Sullivan’s research interests and background are exploring how to provide culturally competent treatment in 3rd world countries, collaboration between occupational therapy and occupational therapy assistant students, creation of new clinical programs, and development of older adults’ community services (e.g., CarFit).